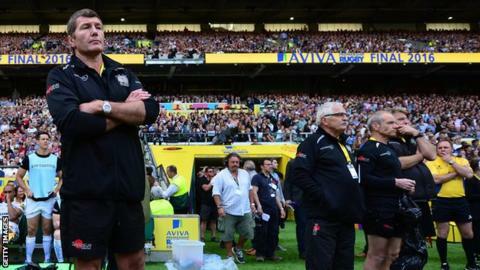 Exeter's narrow loss in the Premiership final is the next step towards their aim of being the best in England, according to head coach Rob Baxter. The Chiefs lost 28-20 to Saracens, having trailed the European champions 23-6 at half-time. "This was going to be a step on where we want to go as a club and where we want to go as a team," said Baxter. "The great thing about how close we've come to Saracens is that it shows were not getting much wrong." Having finished in the top four for the first time in their history, Exeter were competing in their maiden Premiership final, six years after they were promoted to the top flight. "We've come pretty close and that should give us fantastic belief that, if we can keep pushing things a little bit harder, keep getting better just a bit at a time, we're going to get close to these kind of games again," added Baxter, who has been in charge at Sandy Park since 2009. "I'd like to say we've learnt all the lessons we're ever going to learn, but we've not. "I want us to get into a European Champions Cup final in the next few years - we'll probably have to learn some tough lessons in that. "We might learn some tough lessons going away in a semi-final next year because we haven't managed to get a home semi-final, we might be battling it out to get into the top six, there are lots of lessons that we are going to have to learn."